While the 12 Steps have helped millions of people with substance use disorders, a social worker addictions specialist reexamines the common peer support model and finds some limitations. In 2014, an estimated 21.5 million persons aged 12 and older had a substance use disorder (SUD) in the last year, according to the Substance Abuse and Mental Health Services Administration's (SAMHSA) National Survey on Drug Use and Health. In the same year there were 11/2 times more drug overdose deaths than motor vehicle-related fatalities (Hedegaard, Warner, & Miniño, 2017). However, much of the treatment for SUDs across levels of care is founded in or adapted from 12-Step recovery support, such as Alcoholics Anonymous (AA) and Narcotics Anonymous (NA), groups that clearly identify as nonprofessional peer support groups with minimal limited outcome data. As overdose increases in prevalence and leads as a cause of accidental death, and more individuals meet the criteria for an SUD diagnosis, the reliance on the 12 Steps as an accepted standard in treatment facilities and programs should be reevaluated, as other promising treatment and recovery support models generate empirically validated outcomes and success in treating SUDs. Twelve-Step peer support programs are based on the idea, originally formed by the AA movement in the late 1930s, that addiction is a progressive, incurable disease lessened only by undergoing spiritual transformation and abstaining from alcohol or, in other fellowships, the identified substance or behavior (Dodes & Dodes, 2015). Today, the behavioral health definition, and DSM-5 criteria now define SUDs as "a pattern of drug/alcohol use that involves problems controlling your use, continuing to use the substance even when it causes problems, and having to use more to get the same effect or having withdrawal symptoms when you decrease or stop use" (American Psychiatric Association, 2013). A number of general, professional, and scientific sources cite the effectiveness of mutual self-help groups in addiction recovery, but an important delineation should be made between treatment for SUDs and long-term recovery support. Though interchanged often, treatment should ultimately result in reduction or elimination of the negative symptoms of the disorder, while recovery support should help encourage and maintain that improvement, build protective factors and, in the case of SUD treatment, strengthen sobriety over longer periods of time. According to SAMHSA (2016), many elements and modalities compose SUD treatment: individual and group counseling, inpatient and residential treatment, intensive outpatient treatment, partial hospital programs, case or care management, medication, recovery support services, 12-Step fellowship, and peer supports. Treatment, therefore, should be understood to be as complex and multifaceted as the unique individuals presenting for care. SAMHSA's working definition of recovery is: "A process of change through which individuals improve their health and wellness, live self-directed lives, and strive to reach their full potential. Recovery is built on access to evidence-based clinical treatment and recovery support services for all populations" (Substance Abuse and Mental Health Services Administration, 2012). A variety of services that facilitate health, home, purpose, and community, including referral coordination among disconnected service providers, and other supports shown to improve quality of life may run concurrently to clinical treatment or may be provided to individuals not actively engaged in formal treatment but seeking support. Formal treatment facilities, health systems, faith-based or community organizations, peers, and schools offer recovery support services (Substance Abuse and Mental Health Services Administration, 2012). Though 12-Step fellowships are listed as recognized treatment, published literature by AA clearly states that those fellowships do not perform many of the important, synchronous support and care coordination described in SAMHSA's overview of treatment and recovery support services (National Institute on Drug Abuse, 2012). 4. Effective treatment attends to multiple needs of the individual, not just his or her drug abuse. 5. Remaining in treatment for an adequate period of time is critical. 6. Behavioral therapies—including individual, family, or group counseling—are the most commonly used forms of drug abuse treatment. 8. An individual's treatment and services plan must be assessed continually and modified as necessary to ensure that it meets his or her changing needs. 9. Many drug-addicted individuals also have other mental disorders. 10. Medically assisted detoxification is only the first stage of addiction treatment and by itself does little to change long-term drug abuse. 13. Treatment programs should test patients for the presence of HIV/AIDS, hepatitis B and C, tuberculosis, and other infectious diseases as well as provide targeted risk-reduction counseling, linking patients to treatment if necessary (National Institute on Drug Abuse, 2012). • Fellowship for long-term recovery. Formal AA/NA and other peer self-help groups are unregulated but still considered a standard. Lance Dodes, MD, author of The Sober Truth: Debunking the Bad Science Behind Twelve-Step Programs and the Rehab Industry, wrote, "Most of the expensive, famous rehab centers that base their treatment on the Twelve Steps likewise have offered no evidence for their effectiveness. Most of them don't even study their own outcomes" (Dodes & Dodes, 2015). He is correct: AA clearly and publicly states the organization does not engage in or sponsor research. Now covering more than 300 different issues, adaptations of AA continue to underpin the programmatic foundations and referrals for many SUD treatment facilities without the presence of an equally robust scientific research base. While elements of 12 Step have been studied and found to be effective, such as sober sponsorship and 12-Step facilitation therapy, the scientific, peer-reviewed literature is inadequate compared with the rates of addiction and related fatalities seen today and common treatment theory in popular facilities and programs. According to Adam Metcalf, LCSW, behavioral health therapist at the University of New Mexico's Truman Health Services, "Unfortunately, due to limitations in access to services, we do not validate quality of the services provided, but we do schedule a follow-up with the referred patient to assess outcome." Referrals take significant time and resources alone, and without accepted measures and standards of quality and outcome data, providers and the general public do the best they can. The onus of determining quality of adjunctive services falls to clinicians and providers, a significant challenge in the current nonprofit world. "We encourage but do not require patients treated for SUDs to attend mutual help peer support groups for recovery as part of their menu of options for treatment. In our area, this includes AA, NA, and SMART Recovery," Metcalf says. "We also refer concerned significant others to CRAFT, SMART Recovery Friends and Family, and Al Anon. We do not validate quality and outcomes of these services. According to my knowledge of the literature, there is mixed evidence regarding the effectiveness of mutual help peer support for maintaining abstinence." • Inconsistent interpretation of acceptable concurrent addiction treatment, acceptance of relapse as likely, and limited attention to medical risk in recovery. Danna Gobel, LCSW, education manager for the Office-Based Addiction Treatment program at Boston Medical Center (BMC), states, "The recovery process is unique to each individual, similar to the path of other chronic relapsing diseases. Because of the chronic nature of the disease, relapse ought to be anticipated and not be a shameful and unanticipated event in the long road of recovery. As my BMC colleagues remind me, you wouldn't turn away someone who is being treated for diabetes and who just took a misstep with their diet." NIDA encourages this view, promoting research that likens relapse rates for SUDs to common chronic diseases such as diabetes, high blood pressure, and asthma, advocating for the treatment of SUDs with comparable approaches, standards, and understanding (National Institute on Drug Abuse, 2016). • In 12-Step literature there is required acceptance of powerlessness over one's addiction and a concerning notion that hitting rock bottom is required for true recovery. This perpetuates the stigma of weakness and moral failing in those with SUDs of any severity. Similar to the HIV/AIDS epidemic of the 1980s, the stigma of an SUD diagnosis has for decades shaped the general public and behavioral health profession's approach to addiction treatment. While the 12-Step model requires participants to embrace a stigmatized identity/identification as an "addict," there is evidence to show that in those with an alcohol use disorder, a higher perception of stigma decreased engagement with treatment/self-help (Keyes et al., 2010). When asked about the limitations of addiction treatment in the last two decades, Gobel highlights how far we have come from the notion of "hitting rock bottom" promoted in addiction literature and behavioral health training in the early 2000s, citing Glatt's Curve of recovery response that indicates recovery can begin only when one is at the severest stage of disorder: "From that vantage point, treatment for addiction was like waiting for a train wreck to occur and not having any power to prevent this or in the least soften the blow." Instead, evidence today supports models such as motivational interviewing, which addresses SUDs across severity and a person's readiness for change. This encourages implementing a range of services aimed at treating those persons yet to begin formal substance use treatment and those persons already in treatment for an SUD. It also means addressing risk factors for relapse and overdose and enacting preventive measures to reduce the incidence of SUDs. SAMHSA's National Registry of Evidence-Based Programs and Practices promotes the adoption of scientifically established behavioral health interventions. However, unconfirmed effectiveness and varying costs beg a closer look at programs promoted as high quality or luxury when the reality of many of these models have not been shown to have higher rates of lasting sobriety compared with treatment models with specific, meaningful, and long-term outcomes. This is not to say 12-Step philosophy and structure is disappearing from treatment facilities and programs. Nor is it saying that this kind of fellowship has not impacted the lives of individuals in recovery. But these challenges warrant questioning of the behavioral health and medical communities for insight into the new reality of addiction treatment during what has certainly become a public health crisis (Dodes & Dodes, 2015). When asked about her greatest challenge as an addiction treatment provider, Susan Hillis, LICSW, CADC-II,LADC-I, vice president of clinical services at AdCare Hospital of Worcester, Inc. cites "lack of resources, especially for long-term treatment, and having a client who is ready for treatment and due to lack of availability having to have the client wait to access these resources. People are dying before they get enough or adequate treatment, so it is important to engage quickly and be creative about how to engage folks in treatment." Similarly, Ellen Kreida, LICSW, MPH, a clinical social worker at BMC's CATALYST Clinic explains, "The reality is that for most patients, insurance or availability restrict their options, and many patients have to accept whatever program has an opening, regardless of its location, what services are offered, etc. Patients are too often forced to choose between a bed far from their only support or no bed at all. If they choose no bed they risk being perceived as not ready for recovery when there are many factors that go into a decision to accept a treatment referral." She continues, "Resources are understandably prioritized to the patient with the highest risk, leaving many in early recovery vulnerable to relapse with few treatment options. This treatment gap further leads to high risk of overdose and fatal overdose, particularly amongst the most vulnerable." Coverage and cost play an unfortunate role at this decision point, but the variance in cost does not necessarily correlate to effectiveness and statistically significant outcomes (Dodes & Dodes, 2015). There are no capacity issues or waiting lists for 12-Step meetings, assuming one is available in a given community. The lack of access to all other treatment, and abundance of 12-Step meetings, may sway decision-making for those attempting to access care, even when trained professionals recommend higher levels of care or treatment models. The well-known multisite study conducted through National Institute on Alcoholism and Alcohol Abuse Project MATCH deemed 12-Step facilitation as an evidence-based treatment for the improvement of alcohol use disorder. Critics called for further review and comparisons with rigorous scientific research, which highlighted several gaps in the study including questionable study group characteristics and selection bias, suggesting that the AA model and 12-Step facilitation were no more effective than a natural recovery process (Walters, 2002). Author William R. Miller, PhD, emeritus distinguished professor of psychology and psychiatry at the University of New Mexico, wrote, "With the very earliest of these reviews, it became obvious that there was a very large gap between the treatment methods most strongly supported by research and those commonly used in practice. This well-documented science/practice gap eventually led to the international 'evidence-based treatment' movement in addiction treatment and other fields." Miller strongly encourages practitioners and program leaders to still utilize careful review of the available evidence and science, noting that even those researchers with the best intentions review outcomes differently (Miller, Wilbourne, & Hettema, 2003). As policy and payment for SUD treatment require more standardized implementation of evidence-based models, Miller cautions against reliance on only a published list of evidence-based treatments, as that restricts complex treatment decision-making (Miller, Zweben, & Johnson, 2005). Metcalf encourages specific ways to change the practice and perception: "The first step is actually educating medical and behavioral health treatment providers, including social workers, about SUDs, and disseminating best practices in treatment and recovery. Substance use has unfortunately been too long siloed apart from medical and general behavioral health, and there are many myths about SUD treatment. This includes research that shows that even among SUD providers there is a mistaken belief that motivational interviewing and AA/12 Step are the main treatment options and that many are hesitant to recommend medication therapy such as buprenorphine or methadone for opioid use disorder (OUD) even though medication therapy alone is many times more effective than psychosocial treatments in the treatment of OUD, particularly in prevention of overdose. SUD treatment should ideally be viewed as a regular part of holistic medical and behavioral health treatment, not a specialty." Metcalf suggests following in the trend of mental illness, describing SUDs "as a medical and mental disorder just like depression. And just like depression, people do not choose to be addicted. The neuroscience shows us that there are lasting changes to brain structures from substance use and that these brain changes make it more difficult for a person to achieve successful remission from the SUD and cause a person to be impaired in their social, occupational, and educational functioning." There will always be skeptics of any approach to medical and behavioral health care, but skepticism should still be in the context of access to all of the information without judgment and stigma. In a similar notion, Hillis highlights the importance of matching patient-centered goals with referrals and levels of care. "I think it is important to look at what 'success' means. Does that mean [being] sober for the rest of your life, or [having] more sober days than you had last year, [being] more engaged in your family and work life?, etc. Having said that, we look for [the] ability to step down to another level of care, aftercare planning, the ability for adjunct services as needed for each individual client," she says. The NASW Code of Ethics identifies several principles under which the validation and utilization of referral, consultation, dissemination, or implementation of models and programs based in scientific evidence. Ethical Responsibility to Clients 1.16 Referral for Services highlights the expectation that social workers practice within their scope of expertise and refer to other experts when "not being effective or making reasonable progress with clients and that other services are required." While there is ample language about competence within practice, there is little to be said about an obligation to clients to facilitate referrals to providers or organizations that demonstrate proven positive, successful outcomes success. Under Ethical Responsibilities as Professionals 4.01 Competence, 5.02 Evaluation and Research, 6.04 Social and Political Action, the Code of Ethics also indicates that social workers are expected to keep current with practice and knowledge including regular review of published literature and continuing education. Social workers are expected to review and evaluate policies, programs, and practice interventions; encourage and participate in research to contribute to the social work knowledge base; and base practice on empirically based knowledge. 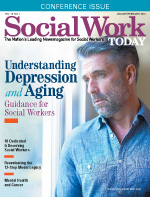 Ultimately, social workers should advocate for the fair treatment of vulnerable populations, encourage informed decision-making by policy makers, and work to improve social conditions. In the coming years, social workers will be at the forefront of integrated service delivery utilizing empirically supported outcomes to drive policy, payment, and capacity changes meeting the growing demand and short supply of comprehensive addiction treatment. The treatment menu funded and relied upon in today's behavioral health world must acknowledge the complexity of SUDs, comorbid trauma, and evidence for judgment- and stigma-free treatment models. Ultimately, access to and rigorous studies of treatment and recovery support outcomes for practitioners and policy makers will move SUD fatalities out of epidemic status as more families and individuals exercise their right to choose truly evidence-based care with ease, affordability, and long-term success. — Kerianne Johnstin Guth, MSW, is administrative director of addiction medicine services at Cooper University Health Care in Camden, NJ. Dodes, L., & Dodes, Z. (2015). The Sober Truth: Dubunking the bad science behind Twelve-Step programs and the rehab industry. Boston, MA: Beacon Press. Hedegaard, H., Warner, M., & Miniño, A. M. (2017). Drug overdose deaths in the United States, 1999-2015. NCHS data brief, no 273. Hyattsville, MD: National Center for Health Statistics. Keyes, K. M., Hatzenbuehler, M. L., McLaughlin, K. A., et al. (2010). Stigma and treatment for alcohol disorders in the United States. American Journal of Epidemiology, 172(12), 1364-1372. Miller, W. R., Wilbourne, P. L., & Hettema, J. (2003). What works? A summary of alcohol treatment outcome research. In R. K. Hester & W. R. Miller (Eds. ), Handbook of alcoholism treatment approaches: Effective alternatives. 3rd edition. Boston, MA: Allyn & Bacon. Miller, W. R., Zweben, J., & Johnson, W. R. (2005). Evidence-based treatment: Why, what, where, when and how? Journal of Substance Abuse Treatment, 29(4), 267-276. National Institute on Drug Abuse. (2012). Principles of drug addiction treatment: A research-based guide (third edition). Retrieved from https://www.drugabuse.gov/publications/principles-drug-addiction-treatment-research-based-guide-third-edition. National Institute on Drug Abuse. (2016). The science of drug abuse and addiction: The basics. Retrieved from https://www.drugabuse.gov/publications/media-guide/science-drug-abuse-addiction-basics. Substance Abuse and Mental Health Services Administration. (2012). SAMHSA's Working Definition of Recovery. Retrieved from https://store.samhsa.gov/shin/content//PEP12-RECDEF/PEP12-RECDEF.pdf. Substance Abuse and Mental Health Services Administration. (2016). Treatment for substance use disorders. Retrieved from https://www.samhsa.gov/treatment/substance-use-disorders. Walters, G. D. (2002). Lessons learned from Project MATCH. Addictive Disorders & Their Treatment, 1(4), 135-139.